Wednesday within the Octave of Black Friday is traditionally known as “Wachet Auf Wednesday,” a day to spend posting YouTube videos of Bach’s “Wachet auf, ruft uns die Stimme” to Catholic Music websites. Because I’ll be celebrating Wachet Auf Wednesday all day today, I do not have time to post here on OnePeterFive. The Boys of St. Paul’s Choir School in Cambridge, Massachusetts, have just released their debut international recording, the aptly named, [easyazon_link asin=”B00MYMTBUW” locale=”US” new_window=”default” nofollow=”default” tag=”onep073-20″]Christmas in Harvard Square[/easyazon_link]. Indeed, in every way, this disc captures the very essence of worship at St. Paul’s during the Christmas season, not only with its characteristic blend of carols and traditional English Christmas anthems, but also with its distinctively Catholic chant and polyphony. From the very moment one lays eyes on the attractive cover art and liner notes, designed by the Benedictines of Mary, Queen of Apostles, one is greeted by the familiar architectural features of St. Paul’s, including the handsome marble altar rail, the statue of the Madonna and Child in the north transcept, and the majestic pillared reredos at the head of the sanctuary. Thanks to the leadership of Rev. Michael Drea, the current pastor, the Blessed Sacrament has been restored to the tabernacle of the high altar, once again giving the place of highest prominence to Our Lord and Savior, a Christocentrism reflected in every facet of this exquisite new recording. “Christmas in Harvard Square” features a good number of traditional carols, giving the recording broad appeal to the casual listener, but presented in a fresh way for the sacred music enthusiast. John Robinson’s clever descants offer a welcome alternative to the ubiquitous Sir David Willcocks arrangements, though Robinson’s setting of the accompaniment to the final stanza of “O Come, All Ye Faithful” is an obvious and pleasing homage to the genius of Willcocks’ brilliant organ arrangement. “Once in Royal David’s City” features the traditional boy solo at the beginning and a newly minted descant, evocative of the distinctive tower bells which chime every quarter hour at St. Paul’s. For my tastes, the descant over the final stanza of “Hark! The Herald Angels Sing” rides a little too consistently above the staff without relief, but the organ accompaniment more than compensates, with a playful pedal line to provide both support and forward motion. Perhaps the most pleasing of the traditional carols on this recording is “Angels We Have Heard,” which alternates the boy choir and men’s schola in the second and third stanza, illustrating the ethereal call of the angels and the earnest response of the shepherds. Robinson’s descant in the final stanza not only captures the bucolic mood of the text but employs a remarkably large range, easily achieved by wisely pitching the entire hymn a whole step lower than the traditional F Major. Many choral ensembles include Gregorian chant in concert programs and recording projects as novelty items which tend to sound like precious, fragile museum pieces. In contrast, the two Gregorian introits on this recording — “Dominus Dixit” and “Puer Natus Est” — were lively and expressive, the kind of chant singing which can only be achieved when the Gregorian plainsong is part of the living, daily prayer life of a choral ensemble. The singing is full-voiced and perfectly pitched, with expressiveness achieved through vocal accents rather than “scooping up” from a fifth or octave below, as is regrettably fashionable among too many chant scholae these days. If any flaw could be detected, one might observe that the stiff tempi of the chants prevented them from transmitting their subtle nuances and natural ebb and flow. The polyphony is reverent yet whimsically buoyant, infused with the sort of joy a wide-eyed boy might experience on a happy Christmas morning. For example, it is nearly impossible for any choir to sing the final “Alleluia” section of the Victoria “O Magnum Mysterium” without sounding either cold and academic or boorish and overstated; but Robinson deftly navigates the divide between these two pitfalls, achieving a balance which is both robust and reasonably tempered. In both the Victoria and Handl’s “Omnes de Saba Veniet,” the men and boys achieve perfect blend and flawless intonation. The solo singing on the recording is consistently first-rate, but the particularly outstanding artistry of chorister Mark Flynn warrants mention. His warm and expressive tone, paired with impeccable diction and unimpeachable intonation, distinguishes him as one of the most important treble voices on the recording scene in this decade. His heartfelt performance in the first stanza of Harold Darke’s “In the Bleak Midwinter” is simply dazzling; and, though I have listened to the recording at least a dozen times in the past week, the refreshing honesty and purity of his solo at the opening of Michael Head’s “The Little Road to Bethlehem” consistently brings me to tears. Indeed, some of the most beautiful tracks on the recording are the English choral anthems, old and new. 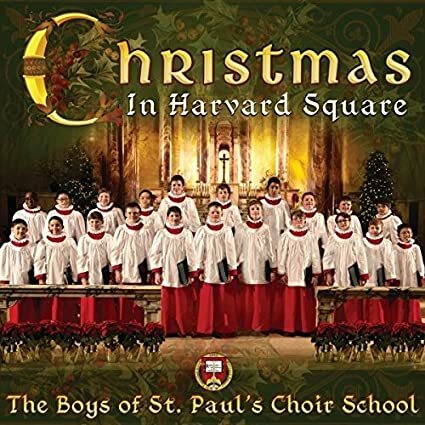 In addition to the Darke and Head, “Christmas in Harvard Square” features several other anthems, including the David Willcocks “Ding Dong Merrily on High,” the Andrew Carter “A Maiden Most Gentle,” and Elizabeth Poston’s “Jesus Christ the Apple Tree.” While the Willcocks unravels a bit in the reverberant acoustic of St. Paul’s, the Carter is as good or better than Carter’s original recording with the venerable John Scott at the organ. The Poston is arguably the finest recording of the work ever created — perfection. Signs of John Robinson’s skill as composer and arranger are not limited merely to descants on this recording. His arrangement of Sabine Baring-Gould’s “The Infant King” for treble voices preserves the pastoral character of the traditional Basque melody. Pitching the entire carol in G Major allows the boys to sparkle in the upper range, while still making the low G below the staff available as a foundation; and, by limiting his harmonic compass to chords native to the key, it makes the use of the lowered seventh at the mention of the Lord’s burial all the more poignant. His arrangement of the “Mater Ora Filium” of Charles Wood, as well as a newly-composed setting of “I Sing of a Maiden,” are also both noteworthy. Dr. Jonathan Wessler, the assistant organist at St. Paul’s, proves himself to be a nimble and reliable accompanist in every track of this recording. Eschewing the dreadfully overvoiced pipework in the chancel (lovingly nicknamed by locals as the “Bangladesh organ”), Wessler almost exclusively uses the original 1905 Woodberry organ in the west gallery. I am told that he employed some of the digital voices of the 1999 Turner renovation, but his sparing, judicious use was undetectable to my ear. When my dear friend and colleague Mark Husey of St. Peter’s, Columbia, SC, was in Boston this summer for the national convention of the American Guild of Organists, he attended the final dress rehearsal of the Boys of St. Paul’s Choir School as they were preparing for the closing ceremonies of the convention. Knowing that he had not heard the boys sing for several years, I asked him what his impressions of the choir were, compared with his previous experiences. He replied, “There is no ‘before’ picture,” meaning that it is simply impossible to compare the current choir to previous generations. What Fr. Drea describes in the liner notes as a “great renaissance” at the choir school is not simply a new chapter, but perhaps an entirely new book. “Christmas in Harvard Square” is a beautiful glimpse into the first few pages – let us pray that the story continues to unfold for many years to come.